Generating new, high-quality leads is hard work in any sales environment! The process of trawling the internet with little more than a name, email address or Twitter handle for a potential lead can prove a huge drain on time and resources. 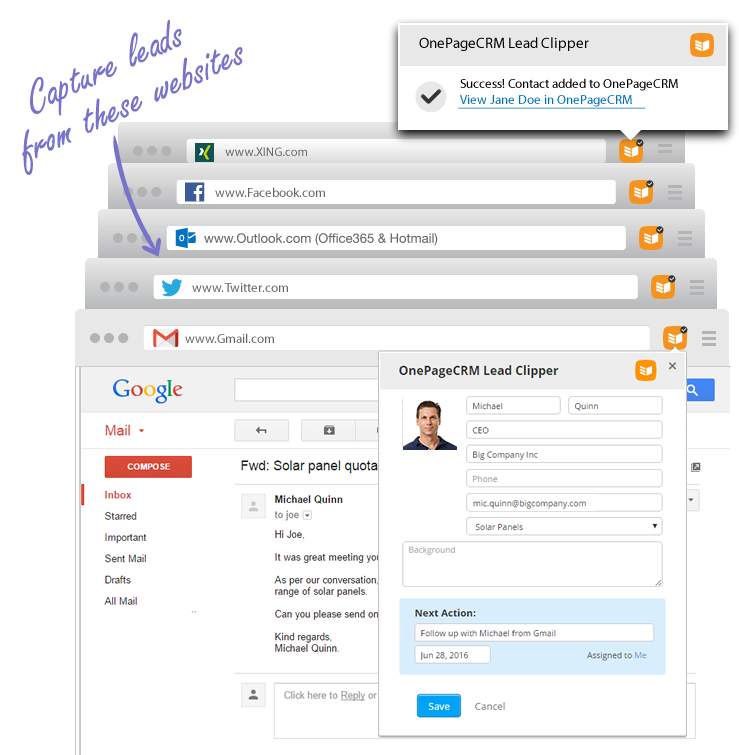 Now allow us to introduce the OnePageCRM Chrome Lead Clipper – lead generation made simple! Take the situation where a lead has reached out to you via email. You want to add them to your CRM quickly, before they become lost in a sea of mails. Copying and pasting is a manual task which can quickly become a chore as your list grows. All of the admin when replicating data eats into your time where you could be actively speaking with your leads and closing sales. 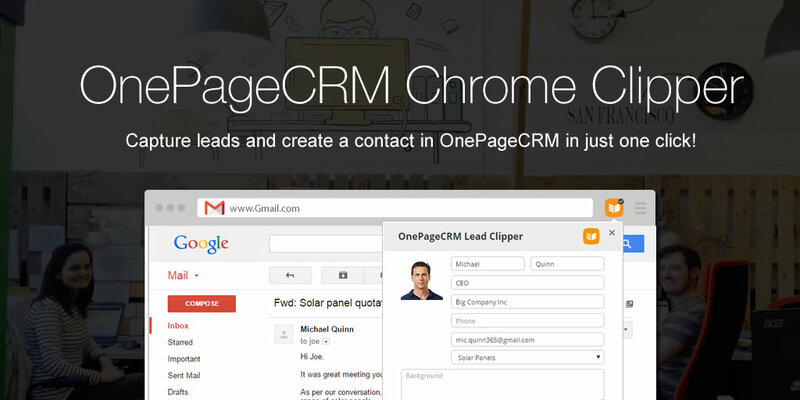 Using the OnePageCRM Lead Clipper you can create leads in your account in just one click. 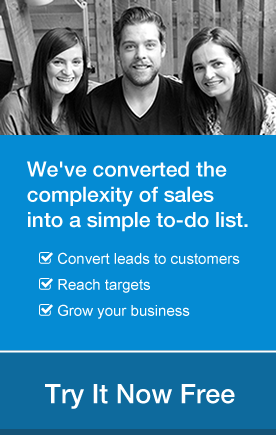 This not only reduces admin but also frees you up to spend more time engaging with your leads. Our Lead Clipper is a Google Chrome Extension which is free to download. It’s designed to work with a variety of platforms, including Gmail, Outlook, Xing, Twitter & Facebook! Once installed, the OnePageCRM Lead Clipper icon will be visible in the address bar when viewing an incoming email in Gmail. A simple click gathers all the available information on the contact and sends it to OnePageCRM. Your contact is created in your OnePageCRM account, complete with a Next Action to follow-up! Check out our superb Lead Clipper tool for lead generation today available through the Chrome Store. Any questions or thoughts on the OnePageCRM Lead Clipper please contacts us at support@onepagecrm.com or comment below! I installed the onepagecrm-lead-clipper but the icon doesn’t show up. I really need this feature. Help me please! When is app going Telus Webmail compatible?? My uses Telus Webmail exclusively. Let me know if this would help you here or if you prefer, my email address is brianm@onepagecrm.com. Thanks, Brian. Is it possible to clip leads from Facebook? Hi Giorgi, at the moment we do not have that functionality for Facebook. It’s something we might revisit at a later date but we have not got any plans to include it right now. Thanks, Brian. Just downloaded leadclipper. Awesome!! It doesn’t send further linkedin message threads to the CRM tool. Is this something it should? If you’ve any more feedback, I’d love to hear it :D comment or send me an email brianm@onepagecrm.com. Thanks, Brian. Any suggestions as to why the Lead Clipper is only pulling Facebook Pages’ URLs but no other information (organization name, email address, phone number, website URL)? I’ve tested the exact same FB Page as the client I’m working with; for her it pulls all that info, but for me, only the Page URL. I’m in Canada, not the US – but that cannot possibly be the reason for this anomaly, can it?!? Hello Anastasia, I am sorry to hear you are having issues with the Chrome Lead Clipper. It should clip all available information on the contact. The fact that it is pulling only select data on the same user for both you and your client is unusual. Can you email support@onepagecrm.com with a screenshot so we can try to figure out why this is happening, please?